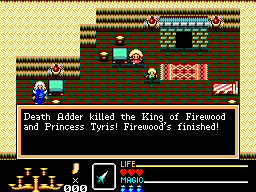 This game is a basic Zelda clone for the Master system. It was a 1990 Sega release. A lot of people say that Zelda games aren’t really RPGs, but they’re close enough to count for me. 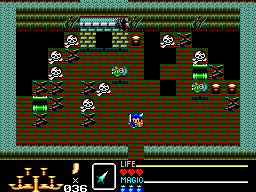 The first "labyrinth" in Golden Axe Warrior. I really do like the color choices in the game. Combat wise, Golden Axe Warrior involves positioning and pattern recognition more than quick timing. You can reflect spears, for example, with your shield, so the orc like warriors become a lot easier to fight once you can adjust yourself to reflect incoming shots. You can handle a lot of non-projectile enemies via just button mashing and then running to a new spot. For a lot of the early game, you can just run through areas rather than being forced to fight them. Fighting also has a purpose in the game. You gain horns to pay for items via fighting, and with care, you can heal yourself in the field via fighting. Another RPG element is the number of villagers who exist only to discuss plot. So, you say, buying items isn’t really a RPG feature. However, strategic purchases, in my mind, do count as a tactical RPG like feature. Much like Zelda having cheaper stores for certain items, there’s a hidden store in the early part of Golden Axe Warrior. It gives you a 20 horn discount on certain items. You unlock it by killing all monsters in a certain area, and then a staircase appears leading to the shop. The monochrome portraits are an odd choice in the game. They're definitely different from the more cartoony look of the Zelda art. A more action based game might limit your exploration to a path, and might force you to always walk that path. Zelda: Link to the Past offers warps for quick travel, and some options for exploration. Golden Axe Warrior lacks the handy “go here next” marker on the map, but it does give you an option to warp back to the spot where you saved last. You also have a number of exploration options. You can go west, into a desert, southwest near a lake, south for a dangerous forest, and east to find a wrecked town. Compared to NES games, it's surprising to see some blatently dead bodies. Though you wonder why the survivors didn't clean up. While there’s no heavy plot, and very minimal non-battle based options for exploration, I still think Zelda clones are close enough to an action RPG to be interesting. Since many action RPGs use Zelda like elements, it’s relevant to consider these games. 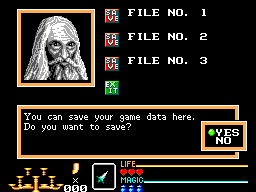 Golden Axe Warrior is a competent game, with some novel elements. The text, unusually enough, is in lowercase, and is pretty honest about the fact that a lot of people have died. 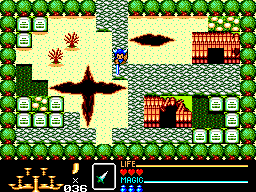 The ruined town has unique sprites, including the marshy green texture near the gravestones. It slows you down. To stop Death Adder, your hero needs to enter dungeons to get crystals. These dungeons seem pretty typical for a Zelda game. Some rooms lock when you enter. You get keys after killing all enemies in other rooms. The game definitely feels pretty ambitious for a Master system game, and it’s able to live up to most of those ambitions. Controls are competent, and the difficulty feels hard, but manageable. Graphically, there’s enough variation that you don’t get lost easily, and the enemies do have a range between annoying to very easy. All in all, I can see why the game’s considered to be a classic. 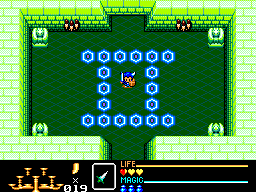 It duplicates Zelda’s good points in combat and progression. It also has unique elements. It’s got a tolerable difficulty curve, and it offers a fairly unique game for the Master system.